IoT is enabled by several technologies including wireless sensor networks, cloud computing, Big data analytics, Embedded Systems, Security Protocols and architectures, communication protocols, web services, Mobile Internet, and Semantic Search engines. 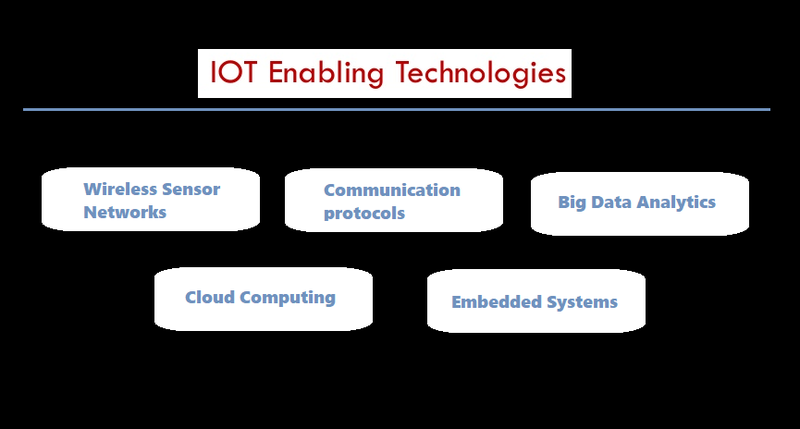 So toady i provides an overview of some of these technologies which play a key-role in IoT. Weather monitoring system use WSNs in which the nodes collect temperature humidity and other data which is aggregated and analyzed. Soil moisture monitoring system use WSNs to monitor soil moisture at various locations. Smart grid use WSNs for monitoring the grid at various points. Structural health monitoring system use WSNs to monitor the health of structures ( buildings, bridges) by collecting vibration data from sensor nodes de deployed at various points in the structure. Cloud computing is a trans-formative computing paradigm that involves delivering applications and services over the Internet Cloud computing involves provisioning of computing, networking and storage resources on demand and providing these resources as metered services to the users, in a “pay as you go” model. C loud computing resources can be provisioned on demand by the users, without requiring interacyions with the cloud service Provider. The process of provisioning resources is automated. Cloud computing resources can be accessed over The network using standard access mechanisms that provide platform independent access through the use of heterogeneous client platforms such as the workstations, laptops, tablets and smartphones. Sensor data generated by IoT system such as weather monitoring stations. Machine sensor data collected from sensors embedded in industrial and energy systems for monitoring their health and detecting Failures. Volume – The quantity of generated and stored data. The size of the data determines the value and potential insight, and whether it can be considered big data or not. Variety – The type and nature of the data. This helps people who analyze it to effectively use the resulting insight. Big data draws from text, images, audio, video; plus it completes missing pieces through data fusion. Velocity – In this context, the speed at which the data is generated and processed to meet the demands and challenges that lie in the path of growth and development. Big data is often available in real-time. Compared to small data, big data are produced more continually. Two kinds of velocity related to Big Data are the frequency of generation and the frequency of handling, recording, and publishing. Veracity – It is the extended definition for big data, which refers to the data quality and the data value. The data quality of captured data can vary greatly, affecting the accurate analysis. Communication protocols form the backbone of IoT systems and enable network connectivity and coupling to applications. Communication protocols allow devices to exchange data over the network. Multiple protocols often describe different aspects of a single communication. A group of protocols designed to work together are known as a protocol suite; when implemented in software they are a protocol stack. In IoT we used MQTT, COAP, AMQP etc. protocols. You can read in detail by given below links. As its name suggests, Embedded means something that is attached to another thing. An embedded system can be thought of as a computer hardware system having software embedded in it. An embedded system can be an independent system or it can be a part of a large system. An embedded system is a controller programmed and controlled by a real-time operating system (RTOS) with a dedicated function within a larger mechanical or electrical system, often with real-time computing constraints. It is embedded as part of a complete device often including hardware and mechanical parts. Embedded systems control many devices in common use today. Ninety-eight percent of all microprocessors are manufactured to serve as embedded system component. It has Real Time Operating system (RTOS) that supervises the application software and provide mechanism to let the processor run a process as per scheduling by following a plan to control the latencies. RTOS defines the way the system works. It sets the rules during the execution of application program. A small scale embedded system may not have RTOS. So these are some IoT Enabling Technologies.